A unique personality . . .
"Ogilvy's sharp, iconoclastic personality has illuminated theindustry like no other ad man's." --Adweek. .
"A writing style that snaps, crackles, and pops on every page." --The Wall Street Journal. "An entertaining and literate book that can serve as a valuableprimer on advertising for any businessman or investor."--Forbes. "I remembered how my grandfather had failed as a farmer and becomea successful businessman. Why not follow in his footsteps? Why notstart an advertising agency? I was thirty-eight. . . .nocredentials, no clients, and only $6,000 in the bank." Whatever David Ogilvy may have lacked in money and credentials, hemore than made up for with intelligence, talent, and ingenuity. Hebecame the quintessential ad man, a revolutionary whose impact onhis profession still reverberates today. His brilliant campaignswent beyond successful advertising, giving rise to such pop cultureicons as the famous Hathaway shirt man with his trademark blackeyepatch. His client list runs the gamut from Rolls Royce to SearsRoebuck, Campbell's Soup to Merrill Lynch, IBM to the governmentsof Britain, France, and the United States. How did a young man who had known poverty as a child in England,worked as a cook in Paris, and once sold stoves to nuns in Scotlandclimb to the pinnacle of the fast-paced, fiercely competitive worldof advertising? Long before storming Madison Avenue, David Ogilvy'slife had already had its share of colorful experiences andadventure. 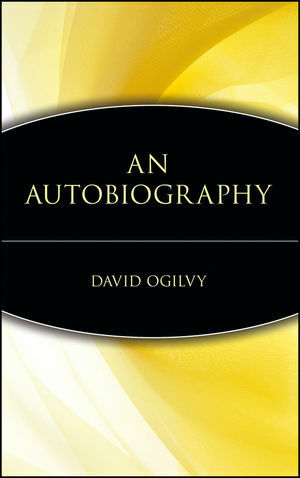 Now, this updated edition of David Ogilvy'sautobiography presents his extraordinary life story and its manyfascinating twists and turns. Born in 1911, David Ogilvy spent his first years in Surrey (BeatrixPotter's uncle lived next door, and his niece was a frequentvisitor). His father was a classical scholar who had played rugbyfor Cambridge. "My father . . . did his best to make me as strongand brainy as himself. When I was six, he required that I shoulddrink a tumbler of raw blood every day. When that brought noresult, he tried beer. To strengthen my mental faculties, heordered that I should eat calves' brains three times a week. Blood,brains, and beer: a noble experiment." Before marrying, his motherhad been a medical student. When World War I brought economic disaster to the family, they wereforced to move in with relatives in London. Scholarships toboarding school and Oxford followed, and then, fleeing academia,Ogilvy set out on the at times surprising, at times rocky road toworldwide recognition and success. His remarkable journey wouldlead the ambitious young man to America where, with George Gallup,he ran a polling service for the likes of Darryl Zanuck and DavidO. Selznick in Hollywood; to Pennsylvania, where he became enamoredwith the Amish farming community; and back to England to work forBritish Intelligence with Sir William Stephenson. Along the way,with the help of his brother, David Ogilvy secured a job withMather and Crowther, a London advertising agency. The rest ishistory. An innovative businessman, a great raconteur, a genuine legend inhis own lifetime, David Ogilvy is one of a kind. So is hisautobiography. DAVID OGILVY is the founder of Ogilvy & Mather, one of the topten advertising agencies in the world. Mr. Ogilvy lives at theChateau de Touffou in Bonnes, France. I Become a Chef in Paris. A Very Large Rural Monastery. A Forest Full of Surprises.